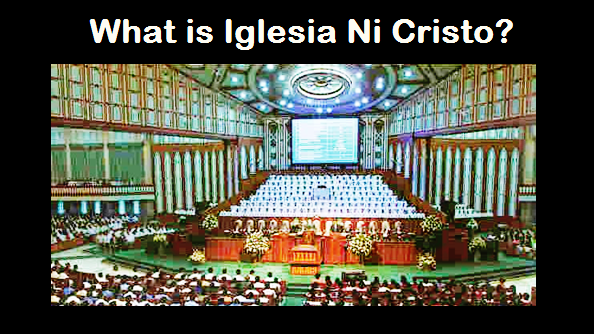 THE IGLESIA NI CRISTO: Try multiplication in the Trinity? This further Trinity’s Absurdity! One divine nature, three divine persons. Multiply? YOU STILL HAVE THREE. One divine nature times three persons is 1 x 3. Well, 1 x 3 is 3. Simple mathematics, isn’t it? 1 x 3 = 1 is an absurdity as 1 + 1 + 1 = 1. Why not 1 x 1 x 1 = 1? 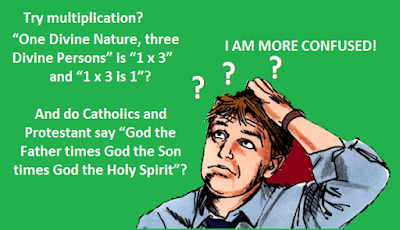 Well, do Catholics and Protestantants say God the father TIMES God the Son TIMES God the Holy Spirit? Or God the father BY God the Son BY God the Holy Spirit? When we multiply we usually say “1 times 1 times 1”, or “1 by 1 by 1.” When we add, we usually say “1 plus 1 plus 1”, or “1 and 1 and 1”, or “1, 1 and 1”. Take note that the Trinity doctrine does not say “God the Father TIMES God the Son TIMES God the Holy Spirit.” Nor does it say “God the Father BY God the Son BY God the Holy Spirit.” The Catholic expression of the Trinity doctrine in Latin is “Pater et Filius et Spiritus Sanctus” or in English “The Father and the Son and the Holy Spirit.” Clearly then, the Trinity is addition, thus, 1 plus 1 plus 1 equals three. If two and two equals five is an absurdity, says Walsh, thus one plus one plus one equals one is no better than this. If God cannot perform an absurdity, according to this Catholic priest, then God would never make up an absurdity such as the so-called Trinity. INDEED, GOD WOULD NEVER MAKE UP AN ABSURDITY SUCH AS THE SO-CALLED TRINITY.